The last time we looked at post-Ghaddafi Libya it was in chaos. The elections of June 25 were finally supposed to put this right. Nothing of the kind took place. Predictably the reasons that led to the war, to the killing of the Colonel and to the subsequent attempts to change the regime are still all there, weighing down on the population which, for the moment, cannot see a way out. The reasons for the war were, in brief, all about Libyan oil and the imperialist structures in the Mediterranean. It all started when the Ghaddafi government penalised the French company Total, and forced it to pay a fine of $500 million. Then came the decision of Colonel Ghaddafi to change Europe's share of investment in Libyan oil, lowering it from 40% to 20%, and making up the difference by giving it to Russia and China. As if that were not enough, Gaddafi canceled a contract that provided for the purchase of a hundred French fighter-bombers, and replaced it with a contract in favour of Russia. It was clear that the "new" direction of the Colonel in favour of Russia and China would have altered the imperialist balance in Libya, North Africa and, consequently, in the Mediterranean, to the detriment of France, the U.S. and its British ally. War, promoted and financed by the latter imperialist powers, was thus inevitable. Its aim was to create an opportunity for Libya to renege on the existing contracts in favour of the Russian Gazprom and Tefnet, and the China National Petroleum Company of China, whilst simultaneously promoting France's Total led by the tycoon Christophe de Margerie, in competition with the Italian Eni. Imperialism, however, is very good at making pots but is not always able to make the lids that fit them. The elections of June seemed to put things right. The secular forces, deployed on behalf of Western imperialism, had the upper hand against the Islamists. The country, after teetering on the brink of civil war for a year, seemed to be on the "right" track for the victorious imperialist powers. Instead the election, fought out in conditions of fraud and violence, has given birth to its opposite, i.e. the birth and consolidation of sections of the indigenous bourgeoisie, all armed to the hilt, and all ready to reopen the previously dormant struggle for control of oil, from east to west and from south to north of Libya’s already battered territory. The first faction is the Zintan group. It has a small army that includes 23 different sections, including the powerful Qaqaa and Sawaiq militias. It is funded by the Ministry of Defence, and controls various media including the satellite channel, al Watan. The Zintan brigade has established a close relationship with the Libya National Army (LNA), another paramilitary organisation of General Khalifa Haftar Ghaddafi, who is literally putting Benghazi to the torch, with the aim of eliminating competition from the Salafist and jihadists groups, and those linked to the Muslim Brotherhood. The Zintan militia and (their ally) Haftar are united in support of the secular, pro-Western parties which emerged victorious from the election at the end of June, but still unable to properly control the territory and, therefore, the transport routes for black gold. Incidentally, Haftar, after falling out with Ghaddafi, took refuge in the U.S. for 20 years. He has collaborated with the CIA and it is said that his reappearance in Libya is due to ties with Obama’s secret services. Second in importance is the Misrata militia. The brigade that liberated the city of the same name and then focused on Tripoli is the same one that captured and killed the Colonel, and through this act is the self proclaimed soul of the anti-regime revolution. It has access to about 40,000 men and 800 tanks. It can also count on the support of the former rebels of the Chamber of revolutionaries of Libya, a subsidiary of the Ministry of Interior and is fiercely opposed to the army of Zintan. Then there is also the 17 February Martyrs Brigade, which is a secular organisation that operates in eastern Libya. Established and supplied by the Ministry of Defence, it consists of 12 divisions that have light and heavy weaponry. This cooperation of military groups and members of the former government is not surprising. The latter with state money funded paramilitary groups to ensure their physical protection and the opportunity to continue to play a political role. In the future, the former have sensed the chance to have a political opportunity to settle things to their liking in the decisive moments of the battle. Both are confident of winning the battle in terms of force and then hope to play their cards over the division of oil revenues. These are the three most important bourgeois factions that have a lot of military hardware. Then there is the archipelago of organisations that look to the political and military experience of the Muslim Brotherhood and jihadist groupings, among which is the Sharia-inspired Salafists of Hansar. The latter is believed to be responsible for the attack on the U.S. embassy on September 11, 2012, which led to the killing of the American ambassador. As already mentioned, what is at stake is oil, the control of its transport routes and marketing, the power to issue the concessions given to large international oil companies, to be that is, the bourgeois faction that has to be spoken to by those whose interests are linked to the oil revenues within Libya and, at the same time, the only negotiator with the international companies. Tragically, these struggles involve not only the major cities, but even the smallest towns. This triggers feuds between ethnic and tribal groups. The victims are mostly civilians who are caught in the clashes between gangs for control of a station or a group of houses. As the carnage continues, the Libyan crisis, the immature product of Western imperialism, which has fostered the growth of ravenous bourgeois factions inside the country, is putting at risk the "prize" for which all this was so violently started. Before the war crisis of 2011, Libya held 2.6% of the entire world production of crude oil, with a supply of 1,600,000 barrels per day. Currently, after three years of civil war battles where both secular and Islamist factions have come to occupy and damage extraction plants and some gas and oil pipelines rather than let go of their bone, the export of crude oil has dropped to 200 thousand barrels per day. 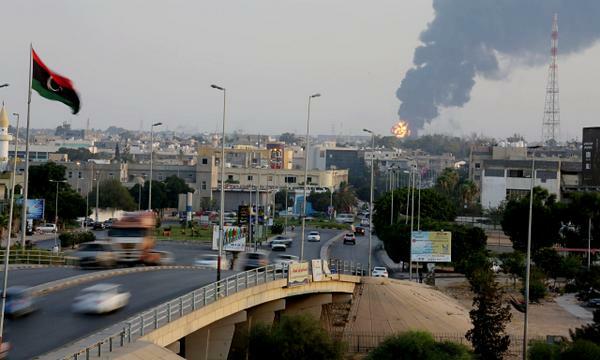 Even in Tripoli an environmental catastrophe is taking place. On July 27, a rocket hit and destroyed a storage plant of 6 million litres of fuel in the southern part of the city. The day after the government urged the population to leave the area for fear of an explosion and also asked the international community for help to calm a situation that could become tragic. In the meantime, almost all European countries and the U.S. have given orders to close their embassies and urged their countrymen and women to abandon Libyan soil. Only the big oil companies such as Total and Eni have remained on site to patrol the area while waiting for the storm to pass or, for their respective governments to do their part in terms of putting pressure on the future government of whoever is in charge, and against the militias. Once again, in the space of only three years the needs of the indigenous bourgeoisie have combined and clashed with the great interests of international imperialism. Whether it is with diplomacy or with weapons, the aim is always to get their hands on renewable energy. The losers, as usual, are the lower classes, the civilian population, who work in the oil centres or in rural areas. They are only cannon fodder to be used to achieve either a secular or Islamist "solution" to the crisis. Ensnared by their ideologies, they swell the ranks of the armed citizens hoping to take advantage of some meagre crumbs in the future.